Have you eyed-up these green leaf beauties in the store. Chances are you have seen these florets in all their green and yellow beauty but may not know what to do with them. Fear not, I will show you how to clean Rapini, also known as Broccoli Rabe and my guess is it will become a staple in your produce picks for your home. I live in Pittsburgh and I find it in Whole Foods. When I find great heads of it, I buy it in bulk, prep it then freeze it for later! I eat a very clean diet, veggies, good fats, almost Vegan on some days, albeit mostly Vegetarian, Rapini is a staple in my dishes. I have become a pro on how to clean rapini as I don’t like sand or dirt in my food so I thought I would share my tips and tricks of the trade for this under-acknowledged veggie. Lavishly live food out loud, take a bite out of this awesome cruciferous vegetable and let’s start cooking! One Empty Bowl filled with salted water or One side of a freshly sanitized sink with a drain stop in it loaded with fresh salted water. Now that you have the tools of the trade let’s take a look at how to clean this vegetable. It is in a fact that easy and the resulting foods that you can add this vegetable to are amazing. Additionally, the vegetable is great as a stand-alone. Remember, this offers a bitter taste when you are plating it, so when you cook it, make sure to add salt to the ‘cook down’ method you use to get the leaves and florets tender. If you find a bunch of this and it has many yellow leaves, do not buy it because it is probably spoiled. The more buds in the bunch you purchase the better, think of these as the ‘meat’ part of the Arugula Avocado Salad . Rapini is also called broccoli rabe. 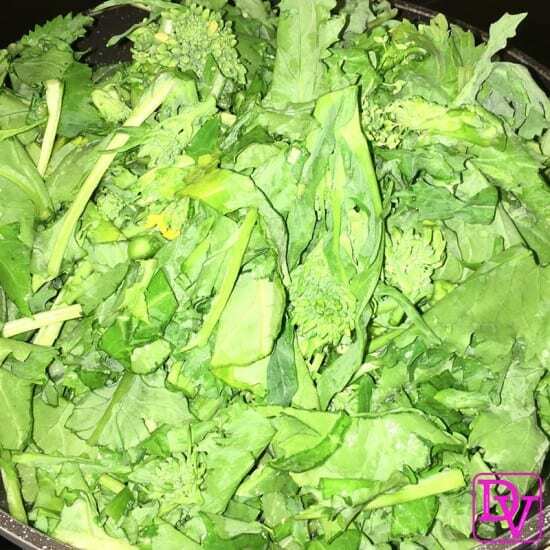 Rapini can be boiled, broiled, baked, microwaved, steamed, grilled, etc. Rapini raw tastes gross IMO. Rapini/Broccoli rabe may be purchased by the pound or by the bunch it depends on each store. The best season for Rapini is Christmas and Easter, some places are able to offer it year round. Look for it by the Escaroles and lettuce in bunches, though it is not a lettuce. Enjoy your How To Cook Arugula Avocado Salad as you have now discovered an Arugula Avocado Salad Delicacy that offers great big taste with very little preparation. Lavishly live food out loud. Need more meatless recipes? I have plenty. Nice! Thanks for this. To be honest I have never even heard of rapini before and it looks really great! Definitely need to try it.